FFA - American Eagle Outfitters appears to have stopped selling recently released hijab. of concern to American Eagle officers and directors. It appears that American Eagle Outfitters (AE) is no longer selling its highly publicized hijab that the company started marketing in July 2017. The hijab symbolizes Islamist oppression towards women that is forced upon them by Sharia law and fatwas. A search of the AE.COM website reveals there are no hijabs for sale. A search for hijab returns several scarves none of which look anything like the special denim hijab AE was marketing. https://www.ae.com/search/hijab A search for denim products reports no denim hijabs. https://www.ae.com/search/denim And a Google search for “ae.com hijab” returns this page https://www.ae.com/women-ponchos-scarves/web/s-cat/7190003 which is scarves, ponchos but no hijabs. 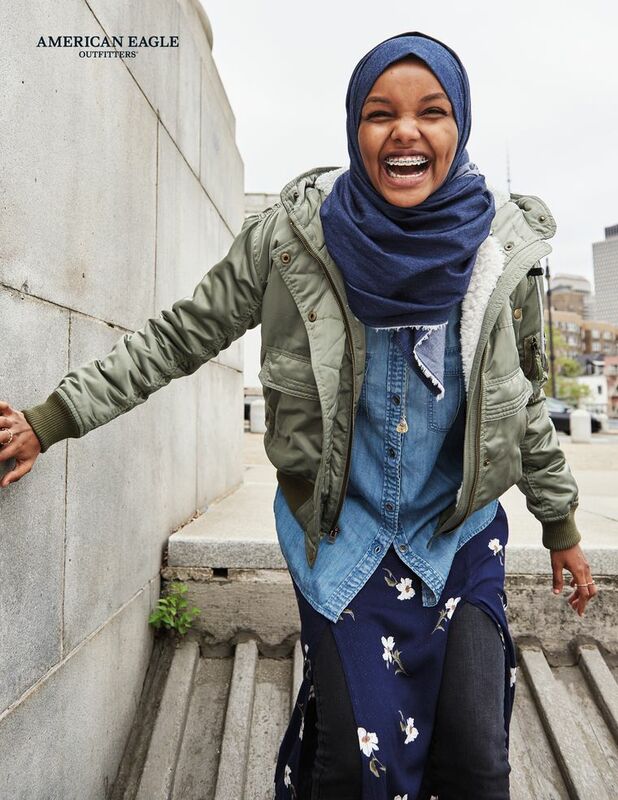 Additionally, an American Eagle Outfitters store manager was asked “do you sell the hijab, the Muslim headwear?” The manger replied “no, we don’t have anything like that in the store.” However, the store did have the promotional poster of Halima Aden wearing the denim hijab located in the women’s denim section. Florida Family Association launched an online campaign to respond to AE’s sale of the hijab that asked people to send a prepared email to American Eagle Outfitters and parent company DSW, Inc. officers and directors. The campaign also encouraged people to post comments on American Eagle Outfitters Facebook page. Over 10,000 people sent emails and many people posted comments on American Eagle Outfitter’s Facebook page that encouraged the company to discontinue the sale of the hijab. It has been three months since the New York Post reported the allegedly phenomenal sell out of the hijab. If the hijab was such a hot item one would expect American Eagle to quickly make it available for sale again. Unless of course if the American Eagle officials received so many email and Facebook complaints that they decided to quietly back away. On the other hand, perhaps American Eagle did not sell as many hijabs as was reported to the press. Additionally, some retail professionals contend that American Eagle only wanted the controversy of selling Islamist attire to bring attention to its brand as well as favor with hopeful Muslim patrons. The Good News is that it appears that American Eagle Outfitters is no longer selling the hijab. Florida Family Association will continue to encourage people to send emails and post Facebook comments regarding Nike’s plans to sell a line of hijabs later this year. Additionally, the action email link regarding American Eagle Outfitters will remain active until a certain amount of time passes.